TSC has introduced two upgraded versions of its popular TTP-2410M Pro printer, TTP-2410MT and TTP-2410MU, that significantly boosts print quality, is faster than its predecessor, and is loaded with enough surplus memory to mass produce even the highest-resolution labels. One of the major upgrades is a new printhead technology, called “Thermal Smart Control” which along with faster processors and upgraded firmware, deliver a level of print quality that is superior to anything previously offered by a TSC midrange printer. Thermal Smart Control tracks and precisely calculates the duration that each pixel needs to be heated to produce consistently clear high-quality labels – one at a time or in batches of thousands. TTP-2410MT/MU prints at up to 14 inches per second (compared to 12 per second for its predecessor), and offers more memory – 128 MB Flash (vs. 8 MB) and 128 MB SDRAM (vs.32 MB). Both printers also come standard with internal Ethernet, USB 2.0, USB host, parallel and serial interfaces. The new TTP-2410MT Series comes with a high-contrast 4.3-inch LCD color touchscreen panel with user-friendly six-button controls for simple printer set up and job status. The TTP-2410MU Series is equipped with the same easy-to-use six-button monochrome LCD display that is currently offered with the TTP-2410M Pro. The TTP-2410MT/MU Series is available in three models, each with a different print resolution: The TTP-2410MT/MU prints at 203 dpi at speeds up to fourteen inches per second; TTP-346MT/MU prints at 300 dpi at speeds up to ten inches per second; and the TTP-644MT/MU produces 600-dpi images, making it ideal for printing very small 2D barcodes, graphics, fine print and other ultra-high-resolution images. The three models can support a wide variety of applications, ranging from healthcare safety, electronics and jewelry labeling to order-fulfillment, shipping/receiving, and work-in-progress labeling. Backed with a generous two-year limited warranty, the TTP-2410MT/2410MU Series printers are constructed of heavy-duty, die-cast aluminum that is built to withstand the toughest environments. All three models are ideal for high-volume printing, accommodate a large 8.2-inch outer-diameter label roll and up to a 600-meter ribbon. 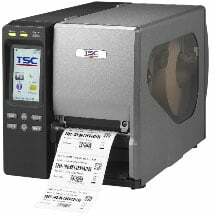 TTP-2410MT/2410MU Series features the TSPL-EZ printer-control language, along with a fully compatible set of standard industry emulations, including Line Mode, Eltron and Zebra languages. They support a diverse range of IT environments, including Oracle, SAP, Unix, AS/400, Windows, Stand Alone, and many more.